We analyze article published, Twitter accounts, and personal websites of every journalist to find the relevant persons, saving you days and weeks of manual research. See Twitter profile, email etc, whatever journalist made publicly available. Enter some key phrases, and we will automatically get you the list of reporters covering your topic. We monitor thousands of reporters, their posts and social profiles daily to find their interests and topics they write about. Look around, read about every person you are about to contact, and pitch them. 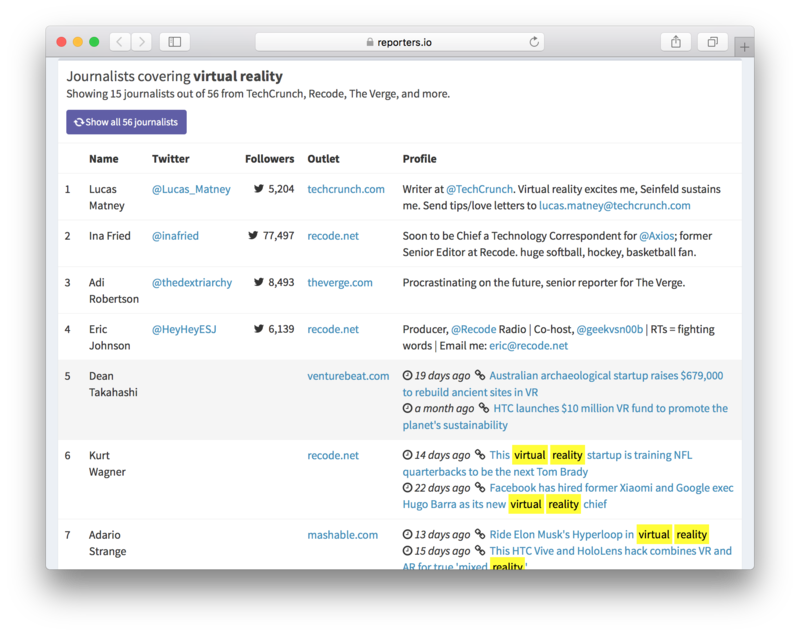 Luckily, you can see self descriptions and contacts of most reporters at our dashboard. Enjoy the flow of customers to your website. Create alerts to get notified about every opportunity to get covered. Get your story covered, overnight.